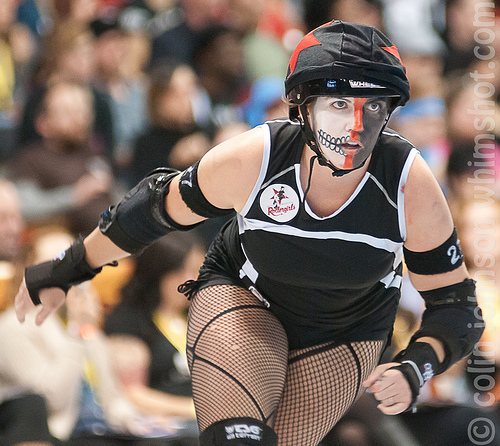 At the 2011 WFTDA Championships, one team stands poised to remain on top. 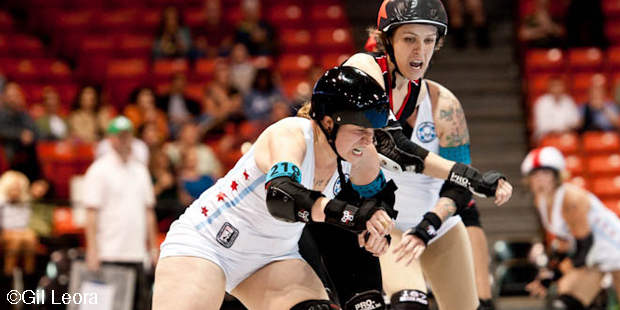 After a month of wall-to-wall regional playoff derby, lots of controversy, lots of action, lots of non-action, lots of surprises, lots of non-surprises, and a lot of waiting…it’s time for the 2011 WFTDA Championships. 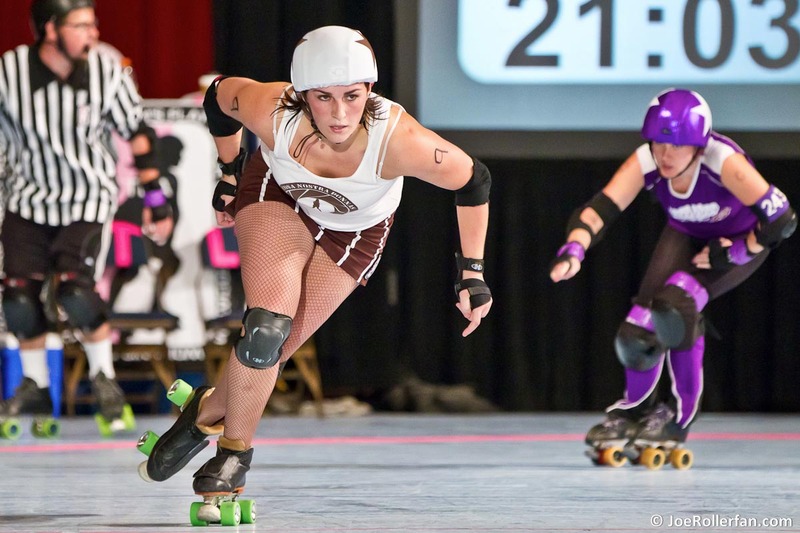 Twelve teams will play for the Hyrda, flat-track roller derby’s biggest prize. But let’s not beat around the bush, here: Only four teams have a realistic shot of winning it, and only two of those teams will survive and make it to the final. As for the other eight in attendance, only four of them will have a legit chance of bringing home some hardware with a third place finish. But between now and the medals ceremony, the brackets are packed to the gills with some amazing games. There’s only one obvious potential blowout in the cards this weekend, but that’s to be expected when you have the best from each region playing each other in a single-elimination format. But there are some surprises lurking, too. Poor, poor Nashville. For two years in a row, you draw the defending champions in your opening game. Last year, Oly obliterated you in the first round. This year, you’re Rocky Mountain’s warm-up for their Saturday game against Gotham. One of these years, you’re going to get a favorable draw that will put you against the weakest #2 regional seed instead of the strongest, but this year isn’t it. At least you can take solace in the fact that you’re at championships, and everyone else isn’t. Naptown damn near knocked off Windy City a month ago. That’s pretty impressive, considering they have never been within striking distance of an elite team before their semi-final game against Windy last month. That close game can be attributed to Naptown’s rapid improvement over the last year and the huge home-crowd advantage. However, besides a 104-78 win over Nashville two months ago, Naptown has never faced a top team outside of their region. Ever. Different regions seem to have a preference for different styles of play, and without this extra knowledge they may find themselves with no way to defend against Philly and their notorious “slow derby” tactics. Though this may actually be a good thing for Naptown if they can crack the code quickly enough (see below), their lack of inexperience against other top teams in other regions may be their downfall. Despite having a first-round bye by winning the North Central playoffs—again—there’s a strong possibility that Windy City will lose their opener on Saturday—again. Denver got them in 2009, and Oly knocked them off last year. This year, they’ll need to get by either Rose City or Kansas City if they want to have a chance at at least a bronze-medal finish, but both of those potential matchups don’t look good for them on paper. Windy City has only played one team from the west this year, but the result wasn’t pretty. Bay Area only allowed them to score 49 points, the worst offensive showing in Windy City history. This is an important data point, because it further confirms that anytime they go west to play a top team in the west region, they get beat up pretty badly; in four games played against western teams at the end of last year, Windy City only scored an average of 70 points. That’s not going to cut it should they face Rose City on Saturday. Kansas City isn’t much better of an option. The former WFTDA national champs beat Windy City on the eve of the Big 5 to take the unofficial WFTDA Central championship. That was back when KC was still top trumps in the south, only to lose that title to Texas during the final at South Central playoffs. However, the Windy City and Texas games showed me that as good as Kansas City can be, they can be equally as bad. During the Windy City game, KCRW led 78-21 halftime, only to be outscored by 38 points in the second half and barely hang on at the end. During the Texas game, KCRW skated an extremely clean first half, taking no jammer penalties. In the second half, they gave up quite a few jammer penalties, and responded by committing some blocker penalties, hemorrhaging a hell of a lot of penalty points. Being inconsistent on defense and with penalty discipline is a death knell when playing against a top-six team in the west region; just ask Denver about that. Then, there’s the Philly Rollergirls. Oh…Philly, Philly, Philly. If there’s any WFTDA team I have a love-hate relationship with, it’s Philly. They’ve got a great group of skaters, but it seems like every time I watch a game with them they’re always doing something that makes me want to jab a stick into my left eye. Philly is one of the teams that seems as if they’ve fully embraced the slow-play strategy that frustrates so many teams that play against it. However, this has been a double-edged sword for the team. While it nets them a lot of points, and wins, Philly has not claimed victory over an elite team for quite some time. They beat Texas while they were on the schnide, and they got really close to Bay Area (a 2-point loss), but they still have a hump to get over. On top of that, Charm City seems to be gaining on Philly, something you wouldn’t have believed that as possible two years ago, when Philly upset Gotham at the 2009 East Region playoffs. But ever since Denver introduced slow derby to the masses a month after that historic upset, Philly seems to have taken that ball and ran with it. Somehow, I think their slide in the DNN power rankings over the months and their adoption of slow derby tactics are not coincidences. This is not to say Philly only does slow derby—God no, they can skate when they have to. But I haven’t seen them do it for a while, and it makes me wonder when the time comes that they really have skate to win, they may not be able to do it; had they skated against London at the East regional, they probably would have lost. I don’t think they’ll be able to pull the same stunt twice. This arm of the bracket is a really tricky one to call. I want to say that Minnesota will fall to Charm City like they did at the first game of Championships last year (Charm beat Minny, 249-118), but Minnesota has improved a hell of a lot this year. Their run at North Central playoffs last year was their coming-out party, and their silver medal at regionals this year was their graduation to the next level. These girls are for real, and are within the same striking distance to Philly (a 17 point loss in August) than is Charm City (average points loss in two games: 17 points). Charm City came oh-so-close to taking out Philly two times this year. Had they done it either time, they very well may have found themselves as the runner-up in the East region. However, Charm is actually in a better spot as third in the region due to a favorable championships draw in the brackets. If they can get through a similarly-skilled Minnesota team in the first round, they’ll face a Texas squad that juuuuust beat them by a scant six points six months ago. It’s a good thing Charm City played a rough schedule this year, with only five of their 14 regular-season games against cupcake opponents; they’re going to need to be tough to get out of this gauntlet of teams. The only game they won in that stretch was the aforementioned victory against Charm City. Notably, that was one of the first games they played in that gauntlet of a schedule; they didn’t beat a top team again until getting the best of Kansas City in the playoffs. Considering Texas was well-rested ahead of their Charm City victory, a extra day off at Championships can’t hurt their chances in the quarterfinals. Whichever of these three teams can get through this branch of the bracket will get a chance to play for third place, seeing as they’ll be unlucky enough to face Gotham* in the semis. Since all of them have a fairly equal shot at getting there, the two games between them will make excellent morning openers to each day’s action. *Rocky Mountain could technically face the winner of The Real Playoffs in the semi-finals. I guess. Rocky is playing at home, and they beat Gotham during Championships last year, 113-79. That’s all well and good, but Gotham wasn’t really Gotham last year. This year, they are. That’s bad news for Rocky Mountain, because although they’re a super-duper elite top-3 WFTDA team and the defending champs, sometimes having four aces is a losing hand in poker. Gotham is just too damn good this year. Rocky Mountain lost to Oly in the final at West region playoffs, and by a pretty decent margin of 37 points. Considering the past history of the two teams, that’s a big points difference. Anyone with an unbiased opinion knows that all signs point to a Gotham-Oly championship final; see below. The greatest tragedy here is that unless Rocky can pull something from their reserves (not so unlikely) or Gotham makes a lot of mistakes (not bloody likely), the won’t even have a chance for a podium finish. Sometimes, the seeding Gods play cruel tricks on us, but let’s not forget what the point of the championship tournament is: To find the one best team in the land. To that effect, it simply cannot be Rocky Mountain. If they beat Gotham, they’re not going to beat Oly again. Even with jokers in their hand, the deck is stacked against them. Rose City, on the other hand, is in a fantastic position to do some serious damage in their WFTDA Championships debut. Their first game against Kansas City is definitely winnable, and their potential second game against Windy City is probably going to be an easy victory for them, considering Windy City’s struggles against teams from the Best Coast. That would set up a potential semi-final game against Oly, and that game won’t be an automatic for either team. While Rose has historically come up short against Oly, they seem to be the only other team in the west besides Rocky that can keep Oly in their sights until the very end despite never beating them. I have to think that now Rose City has gotten a whiff of championships fever, they’re going to believe they can go all the way. While the Hydra is certainly in their reach, they have a more realistic shot at third place should they get to and then go down in the semis. Even though they may not have something for Gotham should they make it to the final (Rose was Gotham’s “closest” margin of victory this year at 68 points), everyone else that has a game against Rose City is going to see a dangerous team with everything to play for. That should make their championship run the most fun to watch. I’m not going to lie. I want to see Gotham and Oly play each other for the Hydra. I rigged prayed the draw would pit the best in the east versus the best in the west for the all the marbles should it come down to it, and thank the stars that that’s what we’re going to get, in all likelihood. Oly will have a harder time getting there, that’s for sure. Their only threat to the crown is Rose City, who is on the verge of breaking through at the worst possible time for Oly. However, Oly has proven themselves to be next to impossible to beat when it comes time to play “go derby,” since their skaters are some of the best at moving fast and changing direction quickly. That all the other teams in the west also prefer to go rather than stop, and that Oly has beat them all, only solidifies Oly’s grip on their region’s top ranking. But as fantastic as Oly is, they haven’t demonstrated that they are a complete roller derby team. 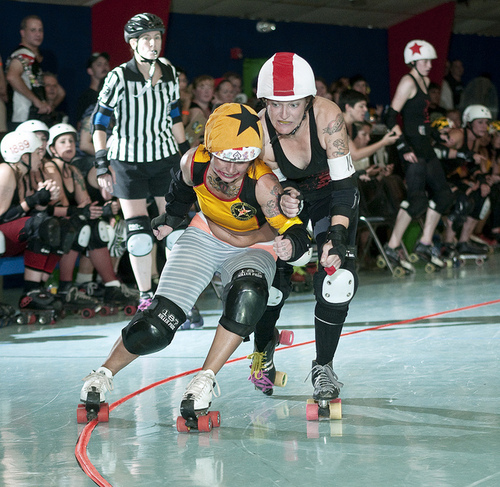 Since ECDX, the “slow derby” game has taken hold over top teams throughout the land. Oly has yet to face a team that heavily relies on tactics like jammer line walls, mass knee-starts, “rugby derby” packs, slow power jam packs, and all of those other crippling (…and unfair) strategies. Some of those things may appear to be easily countered, but then again, it’s been two years since Oly played Gotham, when the slow game was just a curious tactic instead of the mandatory style it has become now. In part, this is why Gotham has become a lethally dangerous team this year. They have proven before that they can play “go derby” when they need to go, but they can also perplex teams with “slow derby” when they don’t want to go. This is the combination for success in today’s game, and would readily explain why any and all comers who dared challenge Gotham have fallen short. Gotham’s toughest games were against Denver and Rose City, games the East champs won by a combined 139 points and were never in any danger of losing. There are two things that put Gotham as the favorites to win the Hydra this year. The first is, of course, their play on the track. Just having Bonnie Thunders and Suzy Hotrod jamming for you is more than enough to light up the scoreboard, so offense has never been an issue for them. But it’s their defense that may be the big surprise this weekend. I remember watching Gotham in the East region final against Philly, when they were down 2-4 in the pack and killing a power jam. Gotham had a 2-wall set up in the front, and those two Gotham Girls were holding back the entire Philly offense for about two laps, longer than would seem humanly possible. People say that Gotham is a machine-like team, and after witnessing that I’m inclined to think that’s more true than people might realize. The second thing, though, is probably the biggest reason why Gotham may be second-to-none this weekend. Off the track, Gotham is serious business. Some people may know that the team arrived in Colorado a week early, so that they could acclimate themselves to the higher altitude and thinner air. But even before that, they went as far as hiring a special low-pressure enclosure to practice in so they could bring the Rocky Mountain air to them, before they went to it. Who does that? I’ll tell you who would: Professional sports teams. While Gotham is a bunch of amateurs just like the next WFTDA roller derby team, that they take the game so seriously is a sign that perhaps they’re destined for bigger things in the future. (Certainly in the near future, where they’re going to go for the $10,000 first prize at the Kitten Traxx Banked Track Invitational in Chicago the following weekend.) I get the feeling that these championships will be Gotham’s message to the derby world that they’re ready to take things to the next level, and no team is going to stand in their way. That’s the reason why I want to see a Gotham-Oly final. We know that Rocky and Oly are on equal footing near the top of the derby world, but we don’t know how much higher the top could possibly go, and we won’t until we see Gotham play Rocky, and then (hopefully) Gotham play Oly. If Oly and Gotham play and we have a Game of the Century, then roller derby is going to go to the next level with at least two teams ready to make the jump. But if Gotham blows out their opponent in the final like they’ve done to everyone else–not impossible, in my opinion–Gotham will quite literally be in a class of their own. Not that they haven’t been before. But this time the class will be closer to the ranks of “professional” derby than has ever been. That’s both exciting and kind of scary at the same time. Just like what Gotham’s opponents have been feeling this year. 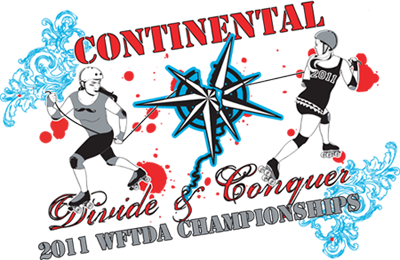 Continental Divide & Conquer: The 2011 WFTDA Championships begin tomorrow, November 11, at the 1st Bank Center in Broomfield, Colo. Live streaming coverage of all the games is available for free at wftda.com.